His remarks came in the wake of Rai's accusation that Vishwas conspired against the party in an attempt to topple the Delhi government after the municipal polls. 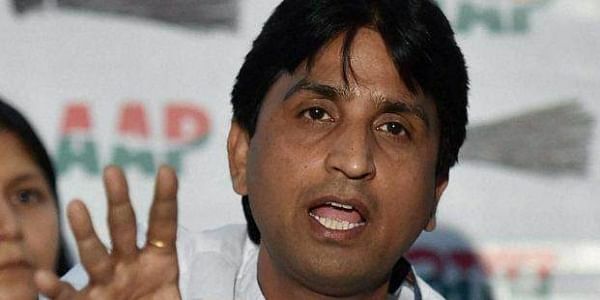 NEW DELHI: A day after he was attacked by party colleague Gopal Rai for making "attempts to bring down the Delhi Government", AAP founder member Kumar Vishwas on Friday hit back, saying Rai should take delight in the contribution of "new Guptas" and not comment on him. "I request him to take pleasure in the contribution made by the two new (in the party) Guptas who have come from the BJP and Congress and not comment on me. "I went with him (Rai) to (his constituency) Baburpur to hold rallies for him. This time, do rallies for Sushil Gupta from there. Become a parliamentarian, and then become the Prime Minister from that constituency," he said in a sarcastic manner. "(North Korean leader) Kim Jong-un seems to have bothered him as well like the rest of the world. He should also head the UN and help in bringing world peace." AAP's Delhi Convener alleged that both Vishwas and sacked minister Kapil Mishra were behind a plan to harm the party. When the AAP on Wednesday named veteran leader Sanjay Singh, businessman Sushil Gupta and chartered accountant Narain Dass Gupta as its debutants for the Rajya Sabha, Vishwas expressed his disappointment over not being considered for the Upper House and claimed he was being "punished" for speaking the truth.